Having tapped his toes for Director Damien Chazelle in LA LA Land, the two are now taking Ryan Gosling’s feet to the moon, and it’s worth the watch. Based on the book by award-winning historian James R. Hansen, First Man follows Neil Armstrong’s journey from being a test pilot after the war to joining NASA and becoming the first person to walk on the moon. There are ample ‘space movies’, and many that have touched on the moon landing, but what makes the movie First Man unique, is its focus on the emotional side of Neil’s experience. It’s less about America’s accomplishments in the space race (although that’s acknowledged), and more about what compelled a guy who witnessed a profound loss of life in war, in family, and in pioneering space travel, to continue with the quest. First Man isn’t your typical space-related blockbuster. It feels almost ‘Indie’ with less fanfare and more room to enjoy the wonder of seeing the world in a new way. 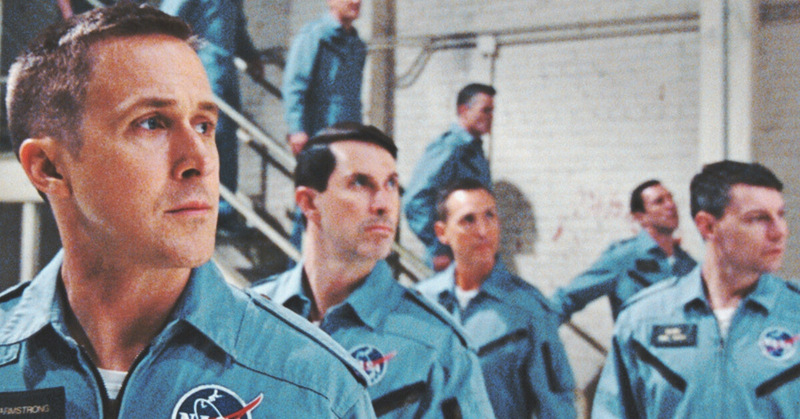 You could say Neil was quietly motivated by a chance to become a historical icon, but in First Man, it didn’t seem like that. During a press conference with the Apollo 11 crew, they were quizzed on what they’d take with them, Buzz Aldrin quipped about bringing his wife’s jewellery and giving her “bragging rights”, while Neil said, “more fuel if I could.” Whatever excitement Neil had about accolades clearly came second to feeling responsible for the mission. First Man is beautifully shot, with an impressive soundtrack. But it’s not your typical space-related blockbuster. It feels almost ‘Indie’ with less fanfare and more room to enjoy the wonder of seeing the world in a new way. Neil Armstrong says, there’s something about the perspective found in space that’s useful for life on earth. However, for a thoughtful movie, there’s one oversight in First Man that’s startling: the absence of mathematician Katherine Goble Johnson. Celebrated in Hidden Figures for a ground-breaking contribution to the space race, including calculating trajectories for Apollo 11, it’s strange she’s not there. Maybe Katherine was working in her segregated quarters, or away from the men in the scenes portrayed, but now that we’re enlightened about her significance she should’ve been cast. Even if only appearing minimally. First Man is a good addition to your space-movie bundle and excellent viewing in IMAX. If you take anything away from it and the risks observed by NASA pioneers, let it be this question: what do I value more? My life, or what offering my life in service can achieve? First Man is in cinemas now. Next PostNext If God Is Good, Why Is There Suffering and Pain?